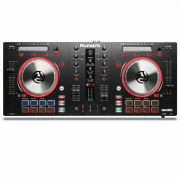 With the huge range of DJ controllers currently on offer it’s often difficult to know which will best suit your needs. One of the most common questions we’re asked is which DJ controller is best for beginners. However as there are a number of software platforms now on offer, ranging from Algoriddim’s Deejay through to Virtual DJ and beyond, the choice will also be down to your preferred software option as much as it will be the hardware controller. Rather than tackle the huge number of software options that are available we’ve condensed the options down to the three, which offer professional features and upgrade paths that allow you to grow as a DJ. Do bare in mind that switching platforms can be quite a challenge once you’ve become accustomed to the work flow, your choice of platform is as important as the hardware you’ll use to control it. We’ve chosen to focus on Rekordbox DJ from Pioneer, DJ Intro from Serato and Traktor Pro from Native Instruments, check out the overview of each platform below. Rekordbox started life as the database management system for the CDJ-2000/900 range when the products were launched back in 2009. Since then there has been constant development, which culminated in the addition of the “DJ” performance features in 2015. In order to provide you with a fair comparison we decided to shortlist controllers under £300. When it comes to entry level controllers for Rekordbox and Traktor your options are limited to kit made by Pioneer and Native Instruments respectively. Serato does offer more options and we've pitted the DDJ-SB3 against the Mixtrack Pro 3, stats for the standard Mixtrack 3 are similar but the unit does not offer I/O capabilities due to a lack of audio interface and the Mixtrack Platinum only provides enhanced visual feedback via the jogwheels rather than revolutionising the Mixtrack platform. When it comes to tactile control there are some interesting points to consider - the Pioneer controllers offer the largest jogs on test while the Mixtrack Pro 3 has the longest pitch faders which will allow for accurate blends. The DDJ-RB and SB3 have the same level of pad control thanks to the inclusion of play and cue buttons (which offer familiarity for users of the pro kit manufactured by the brand). You'll also notice that while the Mixtrack offers those super long pitch faders the gain/trim control has been removed to make way for the channel filters - this is fine if you're willing to put your trust in Serato DJ's auto gain. For an in depth comparison check out the table below, we've graded the controllers underneath.